ROMANIAN MIRACLE IN THE VYSOČINA ARENA! Vlad Dascalu (ROU) took his very first victory in a cross-country race of the World Cup series in the U23 category. Sina Frei of Switzerland managed to repeat her victory from last week in Albstadt, and celebrated gold among women in the same category. The triumph of the twenty-year old champion of Romania is absolutely shocking, since in both previous races of this year’s World Cup series, Dascalu had finished 41st, and 25th, respectively. However, the dry surface of the Vysočina Aréna course obviously suited him well, and did not take the young Romanian by any surprise: the rider from Brujula Team was in the leading group from the very beginning of the race. He started into the final lap a few seconds ahead of his competitors, and eventually, he could take delight in the applause of great audience without fear of being overtaken. Czech riders did not fare well on the home course. Lukáš Kobec was the best of them, having crossed the finished line on 52nd place. Jaromír Skála was 72nd, David Zadák 85th, and Matěj Průdek finished four places behind. Czech women struggled to finish among the best twenty racers. Jana Czeczinkarová had an excellent start into the race, however, she did not manage to keep her position, and after having struggled somewhere around the 20th place for some time, she found strength to finish 13th. This is the result she had taken in the first venue of the World Cup series in South Africa. 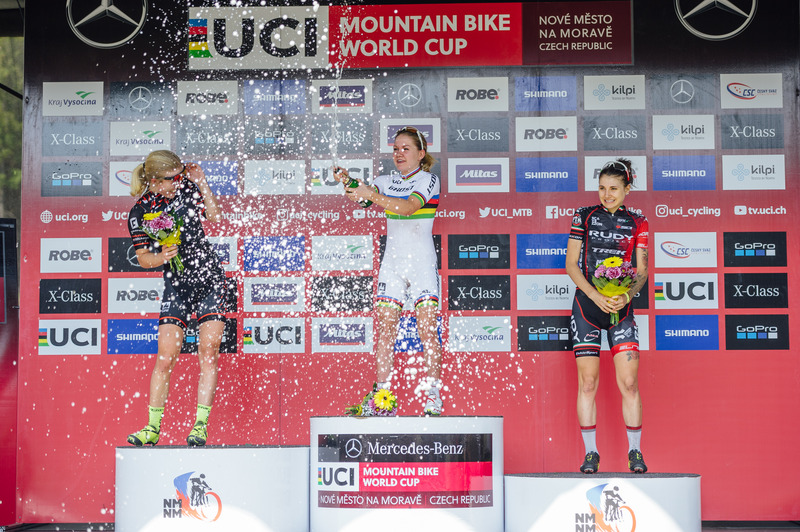 Despite her crash in the final lap, Barbora Průdková finished better than in Stellenbosch, where the 20th place was the best result in the World Cup series for her. She had been 29th last week in Albstadt, Czeczinkarová had been 11th.